Thiruviyar kshethra got its name because there are five rivers namely Kaveri, Kudamuruti, Vennaru, Vettaru, Vadavaru are flowing through this place. Iy means five and aarru means river in Tamil, hence the name Thiruviyaru. This place is very popular among the lovers of carnatic music since it is in this kshethra the Saint Thyagaraja spent most of time and obtained mokha. Saint Thyagaraja is devoted to Lord Rama and many of his composition are in praise of Lord Rama, and it said that he had been graced by the dharshan of the Lord himself. Every year on the Bagula Panchami day the saint's aradhana day is observed, and the entire leading musician finds it a privilege to participate in the function and sing the Pancharathna kriti in front of the samathi of this great saint. It is almost a pilgrimage to all the music lovers to this place during this time. The main temple of this kshethra is that of Lord Siva presiding over as Iyyarappan (Tamil name) or Panchanathiswar (Sanskrit name) and the Sakthi is known by the name Dharmasamvarthini. The temple built during Cholas period is very huge. There are many Nayanmargals who had sung in praise of this Lord. Lord is Swayambhu and is of mud, hence there is no abishekam for the Lord. From the southwest corner of the third prakaram if you spell 'Iyaara' you will be astonish to hear the same echoing seven times. As in the case of other Siva temples the sannathi for the Ambal is not in the same compound. Ambal of this kshethra is Dharmasamvarthini and Her sannathi is in a separate compound abetting the main temple hence known as Dharmasamvarthini temple. Another unique point to note is that while in all the Siva temple the Ambal is seen facing Southwards here in this kshethra she seen facing eastwards. From these uniqueness of the present Dharmasamvarthini temple and the difference in the construction style and the materials used with that of the Iyearrapan temple it is said that Dharmasamvarthini Sannathi was shifted to the present place. It is also said that Sri Rama temple was in existence at this place. The Maratha queen by name Mohanambal had established a new town on the southern bank of the river Kaveri, and named it as 'Panchanatha mohanambal puram'. She had brought in many scholars and pundits to the new town hence the place is also known as 'pudhu agraharam' which still it retains. The queen Mohanambal feel in love at the striking beauty of the Sri Rama and his parivara, at the Sri Rama temple adjacent to Iyerrapan temple in the northern bank of the river Kaveri. She decided to shift this temple to the new town on the southern bank named after her. Presently the temple, which is in pudhu agraharam, is known as "Sri Pattabi Raman Koil" and is maintained by Sri Ramabhadracharyar, from the meager donations received from the devotees. The temple is well maintained and daily arathanas are performed as per the prescribed rules. Sri Rama is seen sitting in veerasana and His left hand is resting on the knee and the right hand is showing 'gyana mudhra'. Sri Anjaneya is seen holding the lotus feet of his Lord with one hand and the other hand is seen in 'dasa bhava' close to his mouth. On to the left of the Lord, (vame bhumisuthaa) Sri Sita Devi is seen holding lotus on one hand and the other is seen as 'ishwarya dhaana hastha'. Normally it is always customary to have Sri Devi on to the right of the Lord of the kshethra. This is the unique in this kshethra that Sri Devi is seen on His left. By her stands Sri Shathrugun waving the royal fan. On the right of the Lord Rama stands Sri Lakshman with the folded hands. Sri Bharatha is seen standing on his side holding royal umbrella. The wonderful scene of the Lord Rama's parivara beholds the breath of the devotees. The most mesmerising of this parivara is the Lord Anjaneya on the left front in the sitting posture holding veena, singing Ramaganam. 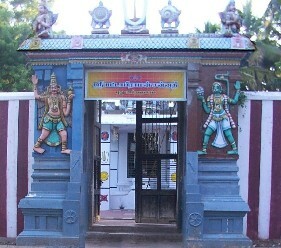 It is unique of this temple that both the moolavar and the uthsava murthis are in the same posture. Normally this arrangement of moolavar and uthsava vighrahas in the same posture does not exist in any temple. The uthsava Sri Rama is seen sitting in the veerasana and giving out vyakyana holding his hand in the 'thathwa gyana' mudra. His parivar are seen as in the posture as described above. Another uniqueness of the Sri Lakshmana is that he holds the bow of Sri Rama along with his. As a dasa of the Lord Rama he is seen fanning the Lord with the samaram (royal fan). Third uniqueness is that Sri Anjaneya is seen sitting on his knees holding Ramayana in one hand and on the other hand he has kept in a posture as if he is holding japamala. The three tycoons of carnatic music known as Sangeetha Trimurthi are Saint Tyagaraja, Sri Muthuswamy Dhikshathar and Sri Shyama Shastrigal. Legend has it that Saint Tyagaraja the follower of Narada tradition was gifted with the "swararnavam" palm leafs by Saint Narada. Sri Muthuswamy Dhikshathar is follower of Hanumath tradition. Sri Muthuswamy Dhikshathar visited Thruviyar invited by Sri Tyagaraja. On a Sri Rama navami day Sri Dhikshathar came along with Sri Tyagaraja and had dharshan of Sri Pattabi Raman of this temple and sung a composition "Mamava sri pattabi Rama…" in raga manirungu. This temple has the uniqueness of having been worshiped by both these tycoons. Firstly Sri Sita Devi is seen on the left side of the Lord as described in "vaithehi sahitham…" which is not found in any other temple. Secondly Sri Anjaneya is seen holding the lotus feet of his Lord with one hand and the other hand is seen in 'dasa bhava' close to his mouth, which is not found in any other temple. Thirdly both the moolavar and the uthsava murthis are in the same posture, which is not found in any other temple. Fourthly uthsava Sri Lakshmana is holding the bow of Sri Rama along with his, which is not found in any other temple. 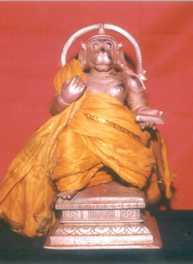 Fifthly uthsava Sri Anjaneya is seen sitting on his knees holding Ramayana in one hand and on the other hand he has kept in a posture as if he is holding japamala, which is not found in any other temple. The temple does not have Rajagouparam and as you enter the temple you are welcomed by the dwaja stampa and bali peedam. Sri Garuda and Sri Prassanna Anjaneya in the mandapam near dwaja are seen with folded hands facing the Sri Rama parivara. After taking permission from them you enter the main mandapam and you can the Garbhagraham. The temple does not have any income other than the denotations from the devotees. With the meager income the temple is run efficiently with the daily puja as per the norms specified under agama rules. The devotees who are interested in helping a noble cause of upkeep of this unique temple in many ways may contact the octogen aarathagar Sri. Ramabhadracharyar. Wherever you are make it a point to help upkeep of this pancha anupam temple of pancha nadi kshethra in your way, you think is befitting to this temple. Make a visit to this temple once in your life time.